Athens-based Eurobank, saddled with bad real estate debt, is buying property company Grivalia for 760 million euros. It can then use the latter’s equity to spin off 7 billion euros in dud loans. It’s a novel way to recapitalise a bank, but probably hard to copy. 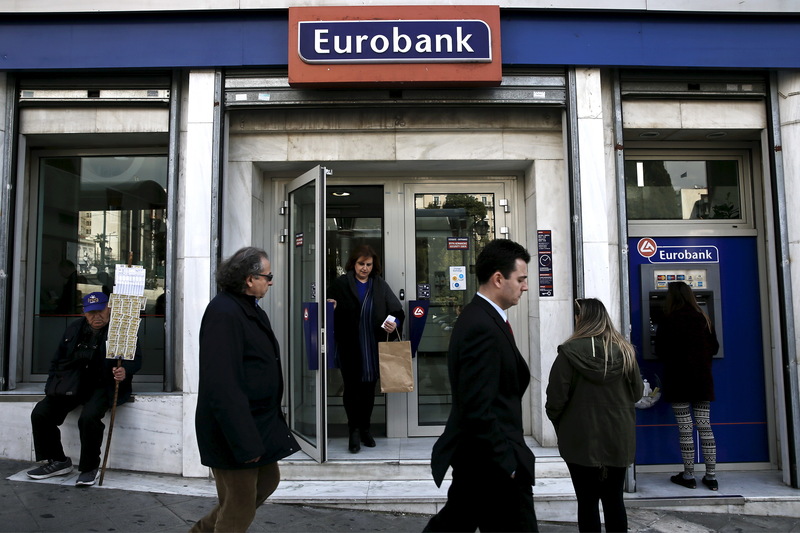 People are seen in front of a Eurobank branch in Athens March 19, 2015. Greek banks saw deposit outflows of about 300 million euros (215 million pounds) on Wednesday, the highest in a single day since a February deal with the euro zone that staved off a banking collapse, two senior Greek bankers familiar with the matter said on Thursday. Athens-listed Eurobank said on Nov. 26 that it would acquire Grivalia Properties in an all-share deal worth 760 million euros. The transaction will boost Eurobank’s capital and speed up the reduction of its bad loans. Eurobank said it will offer 15.8 of its own shares for each Grivalia share, and pay 40.5 million euros in cash to shareholders. The transaction values Grivalia at a 9 percent premium to its market capitalisation on Nov. 23, Eurobank said. The transaction has the approval by both companies’ boards, and Greece's HFSF bank rescue fund, which holds a 2.4 percent stake in the bank. Toronto-based Fairfax Financial Holdings, which holds 18.23 percent of Eurobank and 51.43 percent of Grivalia, also supports the deal. It will hold 32.93 percent of the merged firm. As a result of the combination, Eurobank said its common equity Tier 1 capital ratio would rise by 210 basis points to 13.8 percent. The bank plans to sell 7 billion euros of non-performing loans, allowing it to cut its ratio of bad loans to total lending to 15 percent by the end of 2019, from 39 percent in the third quarter. The merged entity plans to securitise about 7 billion euros of bad debts and transfer them to a special purpose vehicle, issuing senior, mezzanine and junior notes.